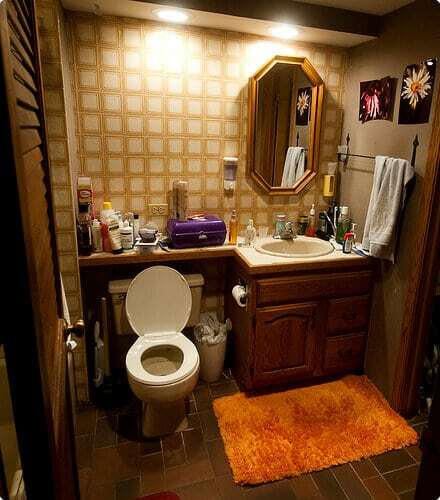 This bathroom hasn’t been changed in the twenty-seven years since Keith’s father built the house (minus some decorative touches). I couldn’t take it anymore! 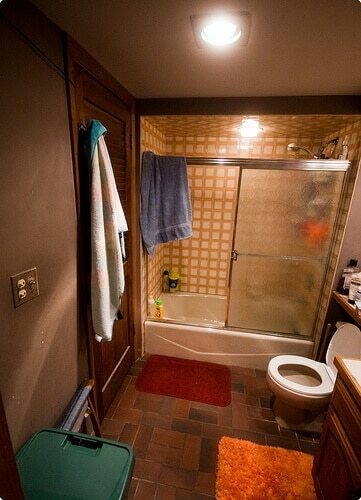 We had a very small budget so we couldn’t redo the tile or the floor but I think we did a huge improvement! What do you think? I am so proud that he sucked it up, removed the shower doors, and let me have a shower curtain! I think it’s rather cute! Our color scheme (to match the tile really) is yellow and orange. I used my own photography of course. We also scrubbed the hell out of the bathroom so it’s so uber fresh and clean right now! Isn’t it amazing what a fresh coat of paint will do? It looks fantastic! I like it a lot. Just doing something so tiny can make something look so much better. I adore your shower curtains, by the way. Thank you both so much! In person it looks SO much better than what we had previously. I love the photo frames. Looks so much brighter! I really like the shower curtain too. So much brighter, and I LOVE that shower curtain!! I love the transformation! It’s amazing how something as simple as paint can transform a room. The paint color itself really opened it up and gave the bathroom such a light and airy feel. I’m in love with the shower curtain! Great colors and great pattern. Overall, you and the BF did an awesome job! Congratulations! Thank you all so much! I bought that shower curtain at Target actually! I love that shower curtain! Looks great! 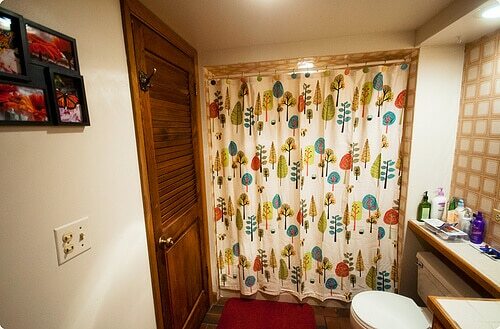 Love, love, love that shower curtain, such whimsy. 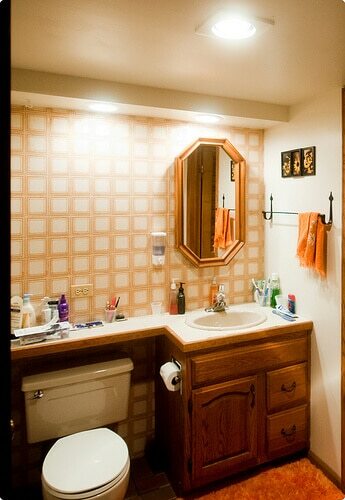 It looks so nice and bright, bathrooms can get so claustrophobic, especially if they don’t have windows. The shower curtain seems to be popular lol! Oh, Cori I completely agree. I wish the bathroom had a window or had the ability to put a window in. Sadly it’s located sort of in the middle/left of the house. More props for the target curtain! =P But really, the whole bathroom looks much brighter and inviting. You did a nice job.